WhatsApp arguably is the fastest and most reliable messaging app in the world right now. But just a few days ago, it announced that it is going to do away with the nominal subscription fee it was charging its 1 Billion plus user base. That sounds like a wrong business strategy at first glance right? After all, it just charges $1 per user per year and almost everyone using the app was okay with it! Given the huge user base, the revenue through this subscription fee model would have been very lucrative for Facebook; which bought the company for $19 Billion in 2014. Users would be able to communicate with a bank and check whether a transaction was fraudulent. Users would be able to check with an airline about a delayed flight. Internet penetration across the globe has reached a breakneck pace in the last couple of years. Broadband connectivity and smartphone penetration in developing countries have also increased exponentially, resulting in more online content consumption. And predictably, online content creators are making a killing, as advertisers slowly shift their focus from traditional to digital media. Video content creators are probably the most prominent gainers from this internet revolution. Most people don’t like watching long-form content on their phones. They would instead use a tablet or a laptop to do that. 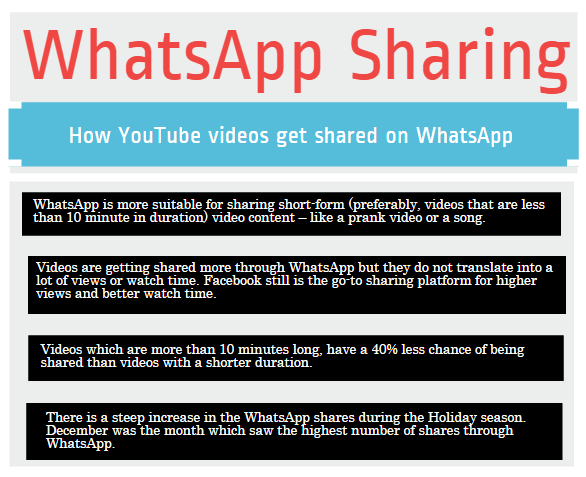 So, WhatsApp is more suitable for sharing short-form (preferably, videos that are less than 10 minutes in duration) video content – like a prank video or a song. 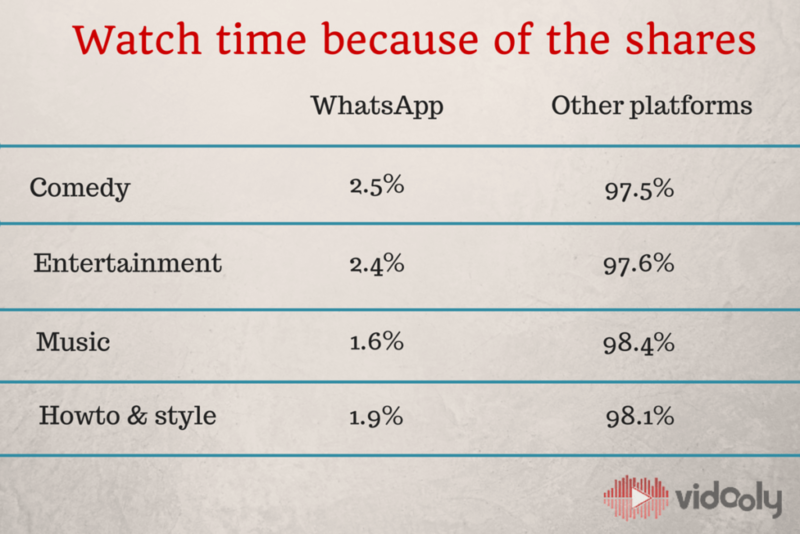 Videos are getting shared more through WhatsApp, but they do not translate into a lot of views or watch time. Facebook still is the go-to sharing platform for higher views and better watch time. Short form content gets shared more on WhatsApp. Videos which are more than 10 minutes long have a 40% less chance of being shared than videos with a shorter duration. There is a steep increase in the WhatsApp shares during the Holiday season. 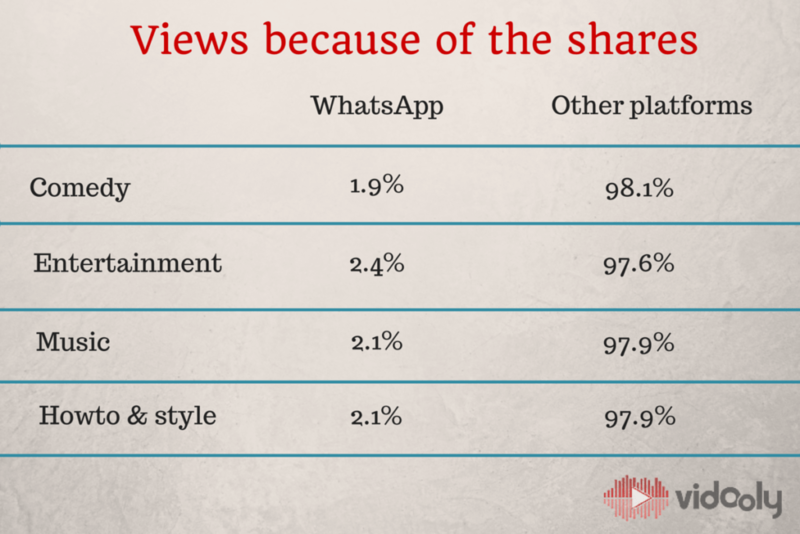 December was the month which saw the highest number of shares through WhatsApp. 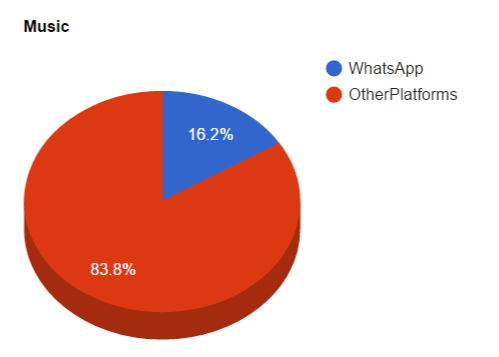 WhatsApp shares is probably because people browse more on their mobiles than on their work computers/laptops. Videos of some categories get shared more than the others. 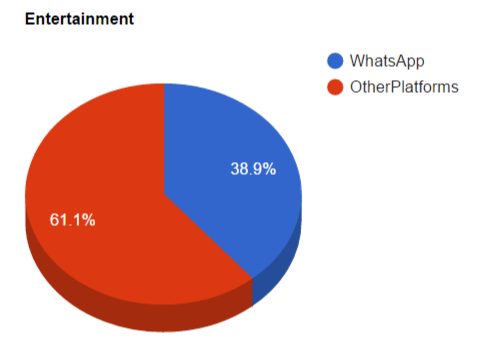 We analysed 100 favourite channels from 4 major categories to find out how their videos shared on WhatsApp – Comedy, Music, Entertainment and Howto & style. What’s the takeaway for Content Creators? 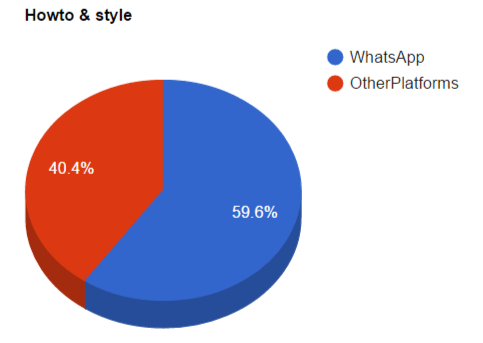 For most categories, WhatsApp accounts for 30-40% of the overall shares! That’s a significant number which can’t ignore. One might argue that the shares to views and shares to watch time translation is abysmally low for WhatsApp. But that mainly because a majority of WhatsApp shares happen in developing economies like India, Malaysia and South Africa where internet speeds are relatively small, constricting the users to avoid playing longer videos to save up on the bandwidth. Things are going to change soon as internet quality is increasing in the developing world and we’ll slowly start seeing a better conversion regarding views and shares. 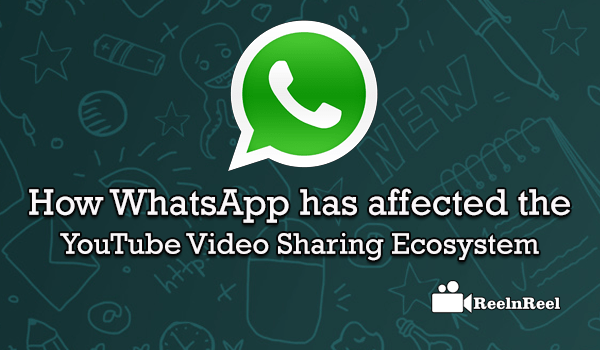 Keeping the video length around 3-5 minutes is also advisable to get more WhatsApp shares. The company which just has around 50 engineers, recently announced on its official blog that it had reached the 1 billion user landmark. Given the pace at which it is growing, one can’t ignore it as a significant sharing platform.